Imágenes de la psiquiatría: 101. 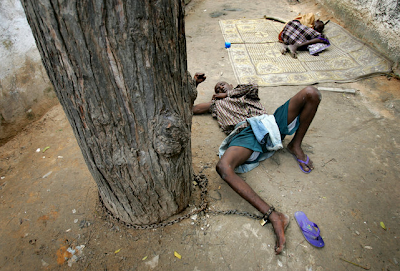 Guerra y enfermedad mental en Somalia. 101. Guerra y enfermedad mental en Somalia. Por fin el Alakrana ha sido liberado. El atunero bermeotarra ha permanecido secuestrado por piratas somalíes durante 47 días con 36 tripulantes a bordo, 16 de ellos españoles. Me alegro por ellos, sus familias y por todo el pueblo de Bermeo, villa pesquera por antonomasia, de donde procedía. Si la pesca ha sido el principal recurso de Bermeo desde su fundación, fue justo en 1900 cuando se inauguró su manicomio, otra de las principales fuente de ingresos para parte de su población que desde entonces ha trabajado intramuros. Establecimiento donde también yo he tenido la oportunidad de trabajar recientemente durante un tiempo, un motivo más para mostrarme aún más sensibilizado ante la noticia. Pero no va a ser esta institución de la que traiga hoy las psiquifotos, sino precisamente del país protagonista del atropello a los arrantzales y su barco. Seguramente que si estos desean seguir faenando con un mínimo de seguridad por esos andurriales, deberán embarcar personal de seguridad fuertemente armado con la tripulación. Pero la solución no puede ser solo esa. No seré yo quien de pistas concretas de por dónde deberán dirigir los esfuerzos nuestros gobernantes a demanda de la ciudadanía, pero cualquier lector perspicaz entenderá enseguida cual es mi opinión. Como lo que aquí interesa es la salud y enfermedad mental, y sobre eso si me considero con cierta autoridad para opinar en voz alta, si quisiera señalar que el nivel de salud mental de una población y sus recursos asistenciales para atajar la enfermedad son reflejo de la salud y bienestar de sus integrantes. No es de extrañar entonces que a algunos somalíes les importe un carajo que para nosotros los piratas tendrían que ser unos señores barbudos, tuertos y con pata de palo. Y se lanzan al abordaje. Pero en este caso no es el “Síndrome de Barbarroja” lo que les afecta, sino la necesidad simple y llana de sobrevivir y no morir de escorbuto marinero u otras miserias tierra adentro. De eso se aprovechan algunos de sus compatriotas con posibles, que esconden y guardan para ellos solos el botín conseguido. Es ahí donde aparecemos en la película el resto del mundo, precisamente en el lugar del mapa marcado con una “X”, donde por fin esconden su tesoro sus capitanes con la ayuda de algún que otro avispado foraneo enterrador. Así de sencillo era también en las películas. Paul Salopek, corresponsal del Chicago Tribune, y el fotógrafo Kuni Takahashi, se hicieron una pregunta bien simple. ¿Cómo afecta un estado de guerra crónico a una sociedad? Visitaron Somalia y llegaron a la conclusión de que, tras una guerra que ya duraba casi dos décadas en 2007, los somalíes se veían condenados a la enfermedad mental. Los casos de trastorno por estrés postraumático, las afecciones psicosomáticas, las descompensaciones de otras enfermedades mentales y la falta de recursos asistenciales, eran los ingredientes principales de tan incontrolable epidemia. Único hospital mental en Mogadisco. Foto © Kuni Takahashi, 2007. Además, la edición electrónica del periódico, incluyó una serie de fotografías acompañadas de un texto en “off” que no puedo dejar de recomendar. Espero que no nos quedemos solo con las imágenes de los enfermos en el hospital (incluso alguien habrá que diga que al menos ahí algo comerán), sino que nos imaginemos como puede ser la vida diaria en las calles retratadas. Estoy seguro de que sacaremos algunas conclusiones para la pregunta de Salopek y Takahashi. Y como no me siento en vena panfletaria, ni quiero que nadie me lo eche en cara, ahí va también el reportaje acompañante, aunque desafortunadamente en inglés, sin desperdicio. War's assault on the mind. In a phenomenon that strikes many strife-torn societies, Somalis increasingly retreat into mental illness. By Paul Salopek. Tribune foreign correspondent. MOGADISHU, Somalia — Abdulrahman Habeb was a man with problems, the most pressing of which involved a barrel of tranquilizer pills. The barrel — containing 50,000 capsules of fluphenazine hydrochloride, a potent anti-psychotic drug ordered from America—was boosting his patients' appetites. This was not good. Patients at Habeb Public Mental Hospital were scaling the facility's mud walls to scavenge for food outside, in the war-pocked streets of Mogadishu. One had been shot. "They don't stop when sentries say 'Halt!' "said Habeb, the director of the only mental health clinic in Somalia's capital. "How could they? They are mentally ill."
Hence, the next problem: Habeb chained some of his 47 patients to their cots. This harsh practice was regrettable, he conceded. But many of his charges weren't just famished, they were aggressive. "They act out the violence of Somalia!" cried Habeb, an excitable man who called himself "doctor," but who really was a nurse—a nurse at the end of his tether. "I cure people's minds, and the war hurts them all over again. You cannot heal here!" He took off his glasses. He doubled over and began to sob. A colleague in one of the cave like wards rushed over to pat Habeb's shuddering back. And herein lay perhaps the biggest problem of all: While Habeb and most of his patients could walk away from their wartime asylum, there was no avoiding the larger nightmare that is Somalia. Doctors and aid workers see troubling signs that untold numbers of Somalis, brutalized by 16 years of chaos and tormented by the suicide bombings and assassinations of a growing Islamist insurgency, are fending off the jolts of violence the only way they can, by retreating inward, into the fog of mental illness. "Ninety-five percent of the triggering factors here are related to the war," a distraught Habeb said. "The fear and worry. Year after year. It is like a bomb." Mention the term post-traumatic stress disorder, or PTSD, and what pops into most people's minds are vacant-eyed GIs grappling with the lingering psychic wounds of combat: anxiety attacks, phantom pains, depression, hyperaggression, sleeplessness and flashbacks. Yet in an age when international terrorism gnaws at the minds of millions of ordinary people, and where millions more are battered by chronic violence in failed states, many doctors have begun to worry not just about the mental health of individual soldiers but of entire societies. Interest in the globalization of war's invisible wounds, and PTSD in particular, has spawned a relatively new branch of medical science—traumatology. Popularized in the wake of atrocities such as the Rwanda genocide and the 9/11 terrorist attacks, its core focus involves treating war-haunted populations with mass counseling. Indeed, it even aspires to help end wars through therapy. High levels of paranoia, emotional withdrawal, irrational fear and other symptoms of PTSD tend to stifle reconciliation, conflict experts say. Traumatized populations are less apt to forgive. Moreover, a study to be published soon in the Journal of Marital and Family Therapy suggests that war-traumatized families in hot spots such as Afghanistan internalize their pain, and plant the seeds of violence in the next generation through child abuse. In effect, whether it involves armies or civilians, mental illness perpetuates states of war. "The humanitarian response to conflicts has always focused on caring for the body," said Sandro Galea, a post-traumatic stress researcher at the University of Michigan's School of Public Health in Ann Arbor. "But what we're learning is that treating stress-related mental problems can actually help break the cycle of war." Not all medical experts buy into that analysis. In Kosovo—the first modern killing field where mental health was made a priority in the aid effort—psychiatrists treated thousands of dazed refugees and war-crimes survivors. The results proved ambiguous. Patient surveys showed that counselors concentrated so narrowly on post-traumatic stress that they overlooked deeper woes such as despair over poverty, the anxieties of displacement, surging drug addiction and the agonies of spousal abuse. Some experts also question whether a Western concept such as PTSD can be applied across cultures. Human grief is handled differently across the globe, they say. And some skeptics go so far as to label mental health crusades in war zones a form of medical colonialism—force-feeding psychoanalysis and narrative therapy to minority cultures. Still, few serious physicians deny that the basic symptoms of PTSD can be found everywhere. And in countries where the killing is ever-present, aimed at civilians and savagely personal—which is to say, in most current wars—its prevalence skyrockets. A 2001 UN report on the state of the world's mental health estimates that 20 percent of all people exposed to low-intensity civil conflicts are scarred by serious behavioral disorders. In some wars, the toll can be far higher. In Sri Lanka, home to one of the planet's oldest and most brutal insurgencies, 64 percent of the populace exhibits some type of mental trauma, a government survey shows. And in the reliably bloody Gaza Strip, a study conducted by the Gaza Community Mental Health Program revealed that only 2.5 percent of Palestinian children were free of PTSD symptoms. Eighty-three percent of local kids, the doctors found, had witnessed shootings. More than 70 years ago, Ernest Hemingway wrote of the insanity of the Italian front during World War I, titling one of his bitterest short stories "A Way You'll Never Be." Today's psychiatrists argue that whole cities and unstable regions are verging on a "way you'll never be"—whether it's in Baghdad, the bone fields of Darfur, the mountains of Afghanistan or one of the most anarchic capitals in the world, Mogadishu. Vast, mostly lawless and plagued by clan feuds, Somalia hasn't seen an effective national government since 1991. At present, the Ethiopian army and the treasury of the United States are propping up a weak transitional federal government that holds sway over the decayed capital, Mogadishu. The TFG, as it is called, ousted a radical Islamist movement late last year. But the fighting grinds on. And it's getting bloodier. Wary citizens edge through Mogadishu on foot or in dented old buses, flinching whenever gunfire erupts nearby. They brave car bombs, insurgent ambushes, corrupt police and thundering Ethiopian artillery to reach their dusty food markets. Children flatten against classroom floors if the shooting gets too close. More than 170,000 people have fled intensifying street battles in Mogadishu over the past two weeks, the UN says. Today the city, once home to 1 million to 2 million people, sprawls half-empty—a grim incubator of wartime trauma. "Nobody knows the scope of the problems because it's too dangerous to work there," said Karin Fischer Liddle, a Somalia specialist with Doctors Without Borders, one of the few Western aid agencies still functioning in the metropolis. Doctors Without Borders had hoped to carry out the city's first mental health survey this year but shelved the plan because of surging violence. "We just assume the needs are enormous," Fischer Liddle said. As it is, Mogadishu's residents have only one option for mental health care: Habeb Public Mental Hospital. Established in 2005, it sees new stress cases every day. Its 50 or so beds technically serve all of central and southern Somalia—a land of war-displaced nomads and farmers with a total population of perhaps 8 million to 12 million. One recent afternoon, its patients sprawled on dingy mattresses in the dim, stifling wards, apparently heavily sedated. Some stared up, glazed-eyed and smiling. Seven were chained by their wrists and ankles to iron bedsteads. A half-naked man stood outside, giggling in purest ecstasy, shackled to a tree. Another's back was crisscrossed with bruises from village beatings. "Somalis treat mentally ill people very cruelly," said Habeb, the shaggy-haired nurse who founded the clinic. "Look." Habeb fired up his office computer. He clicked through photos of hyenas to illustrate the "hyena cure"—a village therapy that involves dropping a mentally impaired person into a pit with the wild predator. The animals are supposed to scare off djinns, or evil spirits, inhabiting the patient, Habeb explained. With a snicker, he ticked off other rustic coping mechanisms for mental illness—beatings, forced starvation, smoking donkey feces. "We are modern here at the hospital," he said. "Mania, schizophrenia, epilepsy. We diagnose them all. We treat them all—scientifically." Habeb's office was littered with jars and bottles of pharmaceuticals. Most of it was paid for by the $50-a-month fee he charges inpatients' families, who often begged the money from relatives in the Somali diaspora. The barrel of American tranquilizers occupied pride of place, the center of the floor. "We don't get many ordinary depressives," he said. "Why? Withdrawal. Sadness. Lack of interest. Low psychomotor activity. In Somalia, all this is natural. These kinds of people just stay in their houses for two or three years." Habeb described his mental health training: a 90-day course sponsored by the World Health Organization. A few weeks before, aid workers had stopped by to see if they might help with funding. They left in a hurry. In their report, they noted that a toddler suffering from malaria had been misdiagnosed with "organic psychosis." Experience literally reshapes the human brain. Memory rewires neurons. That fact has been known by psychologists for some time. Thus, it comes as no surprise that war leaves its own distinctive, scorching thumbprint on the brain. Research indicates that the left frontal region, a nexus of verbal communication, malfunctions—becomes disconnected—when people are exposed to continual, violent stress. A new brain-wave study of torture victims, carried out by scientists at the University of Konstanz in Germany, has borne that out. There's even a name for this wounded state of mind: speechless terror. "Language-related centers become impaired in these cases," said Michael Odenwald, one of the study's authors. "There is a pattern of social withdrawal. This helps explain why reconciliation in traumatized populations becomes more difficult." The war-injured mind exacts other strange costs. Unexplained back pains, stomach cramps, chronic headaches—all are widely recognized as signs of mental trauma, even in Mogadishu's basic first-aid stations. Meanwhile, the links between serious physical diseases and PTSD have been long recognized by the medical community. A landmark study by The New York Academy of Medicine showed that Vietnam War veterans with PTSD were six times more likely to suffer heart disease than those without it. "I am a patient too," he confided, making the rounds in his clinic wards. "I am taking medication for heart problems and diabetes. It is the stress." Habeb said he spent too much time at the clinic. His wife was divorcing him. The things that alarmed his patients were starting to trouble him as well. The knocks on doors that sounded like explosions. The steady buzzing in the sky above Mogadishu—purportedly CIA drones on spying missions—keeping him awake at night. A few miles away, over the city's sandy streets, another Somali health worker commiserated. Laila Mohammed Abdi was a shy intake clerk for a maternal health clinic. Two years ago, clan militiamen shot her husband because they wanted his cell phone. He bled to death in her arms. More recently, Mogadishu's police held a gun against her neck and stripped her naked in a market. They stole everything, including her dress. She couldn't take proper care of her children. She couldn't do her job. "I have got some problem in the brain," she said. "It's getting worse, not better." Abruptly, she began to cry. One of her colleagues, who was translating, turned his head away and started weeping as well. It seemed the most normal reaction in the world, in Mogadishu. Salopek, P. War's assault on the mind. Chicago Tribune. 15 noviembre 2007. Accesible aquí. Sería bueno que hubiera traducciòn porque muchos no entendemos el inglés. Pues eso es verdad, aunque no me sentía con muchas fuerzas para hacer la traducción. Lo siento.